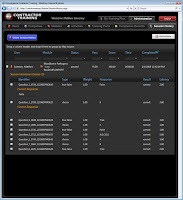 We’ve almost finished updating the user interface for our contractor management software. We’ve added a lot of details to our “Convergence Skin.” We plan to offer custom skins that feature your company’s logo and colors. I’ve just chosen a few screenshots to display here so you can get an idea of what our system looks and feels like. If you’re interested in seeing more, please contact me at kdellavalle@capstonetechnology.com. The image on the left is the “Training Plan” – contractors/visitors/vendors see the training they are required to complete when they login. It can be grouped into “Activities”, and when you hover the mouse over a module, it displays a thumbnail of the contents. 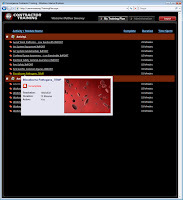 The image in the center is the “Activities” management screen. Activities are just a way to group training. 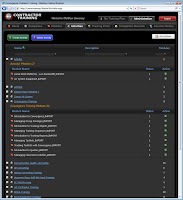 The image on the right is the “Session History” management screen. This is a way to get a window into the activities of the users. Here, you can see tests taken, their passing score, and even the answers that were given.